Golf Gallery of gifts for women. We feature Gifts - Novelties - Prizes. We offer a wide variety of gifts, novelties and prizes for women golfers. If you're running a Tournament, we know you will find the appropriate prize here. We hope you will enjoy the selection. Our on line catalog is our only catalog. Have questions about an item, please don't hesitate to ask us. We're here to help you! Don't forget to tell your friends about our wonderful gifts. 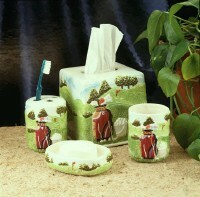 Four piece ceramic set includes tissue holder, soap dish, toothbrush caddy and drinking cup.